Not to be confused with Yalia. Yalia Sagewhisper is the Master of the Shado-Pan's Omnia discipline. These spellcasters are charged with maintaining the wisdom, knowledge, and sacred traditions of the order. She is also the current gatekeeper and she decides who can join the order. Born as Yalia Sageflower to a prosperous fisherman in the Zouchin Village, as she grew up Yalia came to understand that her hand in marriage would be given to the son of another fisherman. However she couldn't help but notice that she had not one but two candidates, Yenki and Chinwa. Over time both pandaren began to compete for Yalia's affection and possessing wisdom beyond her years realized their rivalry would not end even after her hand in marriage had been won. Realizing that this rivalry would only end with one of the pair dead and the other left in guilt, which would destroy both lives Yalia made the difficult decision to leave her home village as a cub, not even half a dozen years old. With the support of her grandmother she traveled from the village towards the Shado-pan Monastery where Taran Zhu accepted her among the order and gave her the name Yalia Sagewhisper. Shortly after the Horde and Alliance discovered Pandaria and explored the continent, Yalia was faced with initiating new pandaren recruits into the Shado-pan. To that end she began the Trial of the Red Blossoms, with the first trial being the Test of Resolve. After the first trial she led the three remaining recruits (Ten, Pei-Ling, and Heavy Chan) to Master Snowdrift so that they could undergo the second trial, The Test of Strength. However during this test to the shock of the Shado-pan a sha interrupted the test and attacked the three recruits, thankfully the three were able to work together to defeat the sha. Hawkmaster Nurong, hearing that the three were still willing to become Shado-pan even after dealing with the sha, had them begin the Shado-pan oath much to Yalia's shock. A scowling Yalia stopped Nurong and stated that the oath can not be the test and must only come after the three tests have been passed. However Nurong in near anger told Yalia that she could not instruct him on his duties and reminded her that tradition has the Wu Kao master administer the final test. Backing down Yalia watches as the three recruits are inducted into the Shado-pan Order. Yalia can be found at the Longying Outpost in the Townlong Steppes, where she directs Horde and Alliance adventurers to help the Shado-pan in the region. With both Vol'jin and Tyrathan Khort recovering at the Shado-Pan Monastery, Yalia was concerned that the Shado-pan could be dragged into the Horde-Alliance conflict. She was further concerned that the two might try and kill one another while they were recovering from their injuries. However both Chen Stormstout and Taran Zhu were able to appease her concerns by promising to inform the warriors of a "no-kill rule" and about how the Horde and Alliance had been helping the Pandaren. Meanwhile due to his numerous visits at the monastery, Yalia found herself growing close to Chen and they would end up traveling to Zouchin together, where with his encouragement Yalia was reintroduced to her family. When word came that the Zandalari were going to attack the village the pair helped evacuate the village, while Vol'jin, Khort, and Shado-pan agents fought off against the Zandalari. After making sure that the villagers would be all right Yalia returned to the Shado-Pan Monastery, where after a short period she was reunited with Chen who had escaped the Isle of Thunder with his companions. It wa then that Yalia became part of The Thirty-three and fought to protect the monastery against the Zandalari. It was while setting traps against the Zandalari that Yalia and Chen admitted their feelings for one another and kissed, while admitting their desire to have cubs with one another. After successfully repealing the Zandalari offensive, Yalia and Chen parted ways, as Chen promised to return, but decided to help Vol'jin launch the Darkspear Rebellion, and Yalia promised to wait for him while she aided the Shado-pan. Yalia can be found among the Shado-Pan Assault force which seeks to put an end to the Thunder King, she is there to assist the player and Taran Zhu in the final confrontation with Shan Bu, and is there to witness Taran Zhu quelling the fighting between the Sunreavers and the Silver Covenant. Yalia can be seen on the Timeless Isle overlooking the Celestial Court with Ling of the Six Pools and Sam the Wise. As some of the best alchemists that the Conclave at Netherlight Temple had to offer, Yalia and Zabra Hexx traveled to Azsuna to aid the Illidari on the front lines against the Burning Legion. Prophet Velen sent the Conclave's High Priest to find the two of them so they could prepare an extract that would grant him a vision of the future. While in Azsuna, Yalia and Zabra were attacked by the local murlocs, and dropped the supplies they were delivering to the Illidari while they fled. The two were also separated in their fleeing. After the High Priest saved Zabra from basilisks and helped to rescue Yalia from the murlocs that had imprisoned her, Yalia and Zabra looked for ingredients for Velen's elixir while the High Priest delivered their supplies to the Illidari. Afterward Yalia expressed admiration of the High Priest's willingness to help, and told them that they did not need to go into battle with the Burning Legion alone. We will not rest until our duties here are done. Be blessed by the light. Even the light can run out of patience! Please take your body and soul elsewhere! Do not make me mind control you off a cliff! Keep the shadows at bay. Our enemies shall fall before us. Our enemies underestimate the power of the light. They have to get pass me first. Let the light protect us. I will shield you from harm. Your willingness to help is admirable, and it gives me insight into what kind of leader you will be. I know you mean to gather priests from all factions and lead them in a battle against the Burning Legion. It's an extraordinary task, but one that you will not have to embark on alone. Interestingly, Yalia makes several mentions of the Light in her on-click voice quotes despite Jojo Ironbrow giving the impression that the Light is a foreign concept to pandaren when the Tushui arrive in Stormwind. 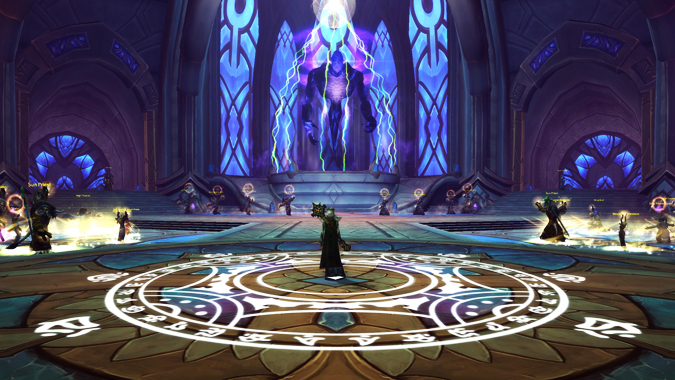 However, the Light is also mentioned in Omnia priests' quotes, indicating that knowledge of the Light is already well established among some of the pandaren by the time of adventurers' arrival in Pandaria. One possibility is that the term is not used on the Wandering Isle (Jojo's home), but is used on Pandaria. She a stickler for tradition, and objected when Nurong did not conduct the Test of Spirit of the Trial of the Red Blossoms the traditional way for Ten, Pei-Ling, and Heavy Chan, even due to their unusual circumstances. Ironically, Yalia herself never had to go through the Trial of the Red Blossoms at all to join, due to being six years old and her own set of special circumstances. Yalia is noted to be dour-faced, wearing her gray hair pulled back behind her ears, and speaks with a stern voice. Yalia is voiced by Minae Noji. In the Legion alpha, Yalia was originally present in Netherlight Temple during the quest The Light and the Void, she was replaced by Delas Moonfang in the beta. At some point during testing she was named Mi-Lee Cirrus.